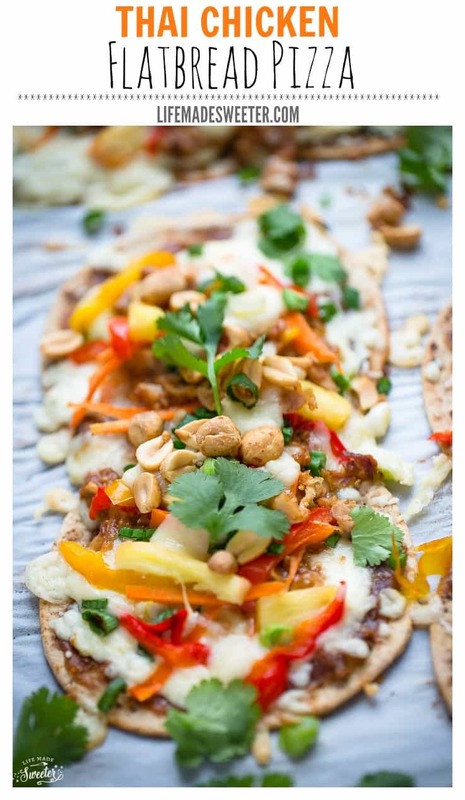 Thai Chicken Flatbread Pizza is the perfect easy weeknight dinner or party appetizer. Best of all, ready in less than 30 minutes and packed with tender rotisserie or leftover chicken, gooey mozzarella, crisp fresh veggies and a sweet and savory peanut sauce. I am always on the lookout for anything that helps save time in the kitchen on those busy weeknights. Since chicken is the hubs and kiddos favorite, we usually like to pick up a rotisserie chicken when we are short on time. It makes getting dinner on the table so much easier. Plus, you can’t beat all the different ways you can use it. That’s why I was so excited when I heard that Trish from Mom On Timeout was writing a cookbook. 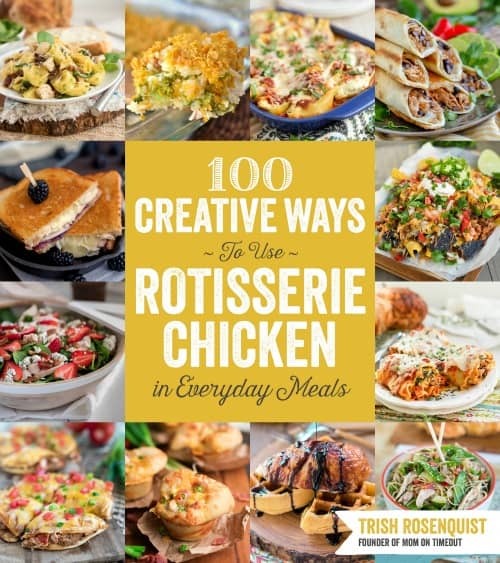 It’s titled 100 Creative Ways to Use Rotisserie Chicken in Everyday Meals. Such a great resource for busy families! This Thai Chicken Flatbread Pizza from Trish’s book was super easy to make and a hit with the family. I added a kick of heat to the savory peanut sauce and it was amazing paired with the gooey mozzarella, shredded carrots, bell peppers and green onions. We always top our pizzas with some fresh pineapple whenever we can and I also like to throw in some baby spinach for a dose of greens. Bake about 10 minutes until golden bubbly then garnish with cilantro, and crushed peanuts. Like all of the recipes in this cookbook, this flatbread pizza is quick and easy to prepare, which is perfect for any busy family. I can’t wait to cook my way through this book, it’s already got a permanent place in the kitchen. 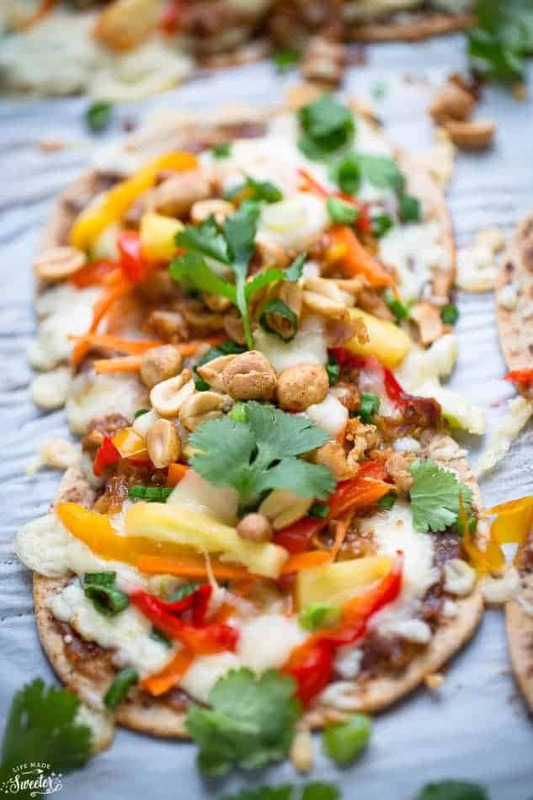 Thai Chicken Flatbread Pizza is the perfect easy weeknight dinner or party appetizer - topped with sweet and savory Asian peanut sauce, tender rotisserie chicken, gooey mozarella and crisp fresh veggies. I’m always looking for easy shortcuts in the kitchen, especially during the week! I love how flavorful this flatbread is, Kelly! I’ve never thought to use thai flavors before, so I can’t wait to try this out. Sounds like the perfect weeknight meal! We love buying rotisserie chicken at the store! 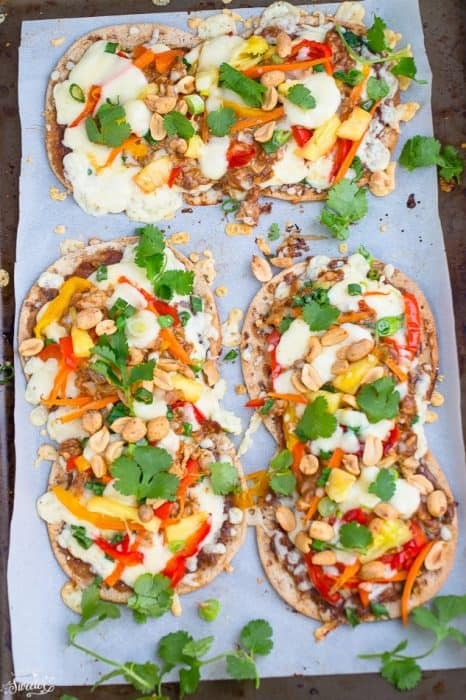 The cookbook sounds wonderful, as do these amazing flatbread pizzas! Kelly, I love this flatbread pizza idea!!! Totally going to try this and I still need to get Trish’s book!!! What a great weeknight meal! Love the flavors of this pizza! I love pizza but don’t eat enough flatbread pizza! I honestly don’t remember the last time I had one. Loving the idea of thai chicken! It sounds super tasty! Kelly, you’re inspiring me to pick up some rotisserie chicken and make pizza! My son just loves rotisserie chicken and I do use it as a shortcut (so convenient!). I can’t wait to make some pizza with it soon…and this thai chicken looks absolutely scrumptious. This is one delicious pizza and I like how she adds an extra flair here. Totally reminds me of our recent trip to Thailand. Yum! This looks great! My boyfriend and I have taken to buying rotisserie chicken too for quick weeknight meals. This flatbread pizza is going on rotation soon! I love how unique this recipe is! Plus, your photos are gorgeous! I will definitely need to try this! I love easy dinner ideas like this. I love the sprinkle of peanuts on top!!!! Kelly! You are SO awesome! You did such an amazing job!! Thank you so much for reviewing my book my friend!! Oh yum! 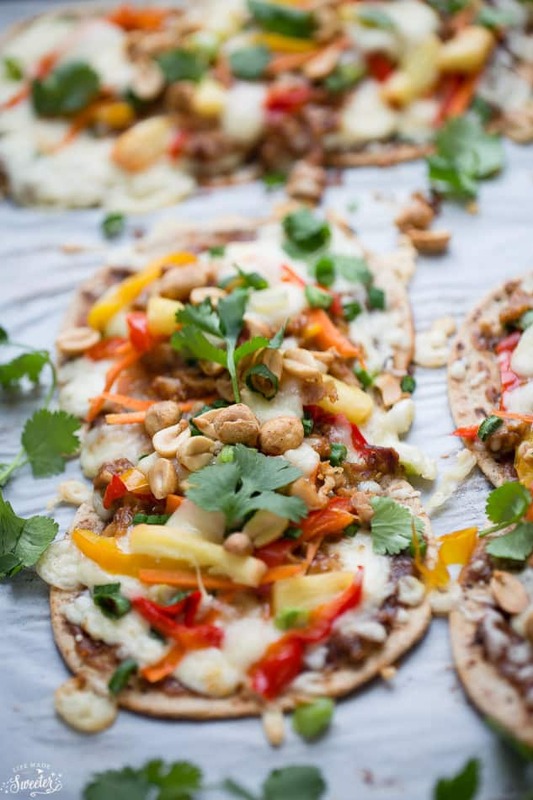 I love thai chicken pizza, and this is such a genius way to get dinner on the table in a flash. Love it! So colourful and tempting! I like to use flatbread to make pizza too…but nothing as fancy as yours. I LOVE making pizzas on flatbread! And thai chicken?? Yes yes! Plus, it’s so pretty with all those vibrant colors! Happy Wednesday Kelly! this pizza looks really flavorful! YUM! You know I’m always on the hunt for quick and flavorful meal ideas and this definitely fits the bill! Peanut butter and teriyaki sauce? Who woulda thunk it?! And as always, stellar pictures, my friend! I hope you and the family had a fantastic new year! Trish’s book is SO awesome! It’s got a permanent spot in my kitchen right now! 🙂 You did an awesome job with her flatbread pizza and I’m totally drooling over here, girl! YUM! Love the thai flavors in flatbread form. This is such a great idea!!!!! Those rotisserie chickens are the best invention ever! 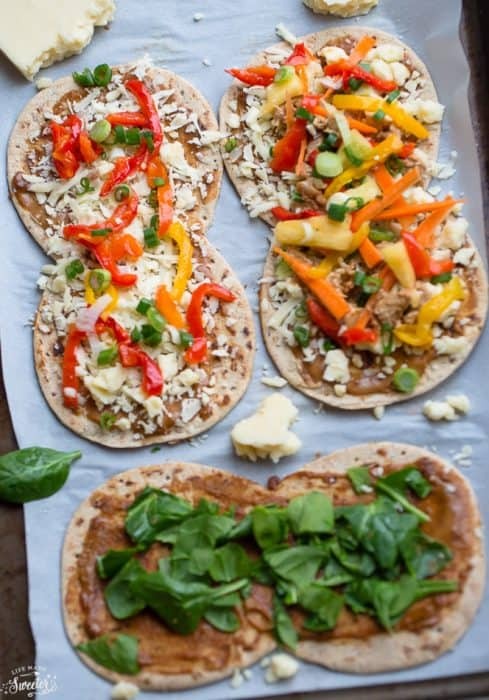 This is such a great idea for a cookbook and those flatbread pizzas sound delicious! 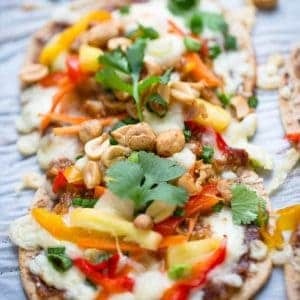 I love everything about this recipe, I love thai flavors, especially peanut sauce and this flatbread looks divine! Also I need to get my hand on that book! I love hack cookbooks like these they can make life in the kitchen so much easier. These look great Kelly. I’m a big fan of rotisserie chicken and this recipe is proof positive of how wonderful meals can be using it! Your pictures are fabulous, my friend! I want to jump through the screen and munch away!